Longer than a wash cloth at 28x100 centimeters - extends your reach easily. Creates a rich lather while stimulating skin and blood circulation, Great for cellulite massage. Makes an great gift when combined with Japanese body wash and bath salts! Four vibrant colors, Made in Japan. 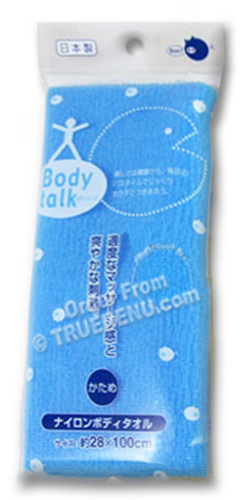 A wonderfully practical and great performing body wash towel from Japan that will let you say goodbye to loofahs and cotton cloths. Exfoliates like a dream, terrific massage for cellulite too. More hygienic than a loofah, longer and faster-drying than a cloth towel. Extra long, super hygienic and easy to care for - what more could we wish from a wash towel? For about the cost of regular bath linens and bath towels, you can completely upgrade your bathing routine with our selection of exquisite Japanese towels. They last forever (nearly), make you feel great, and require no special care other than tossing them in the wash once a week. Okazaki brand features a firm weave in four vibrant colors: bright pink #7112, brilliant blue #7113, marigold yellow #7114, and florescent green #7115. TrueRenu has one of the largest Japanese Wash Towel collections available - from the award-winning Salux brand, the Cure series and luxurious silk from OHE, Aisen and Okazaki. TrueRenu does the searching - and researching - for you, scouring the world for hard to find, hard working products. We carefully evaluate them, making sure that do what they promise, and we bring them to you with detailed descriptions. Wet, apply soap or body wash, emulsify to thick foam and wash. Rinse under running water, wring and hang dry. The nylon is fast drying and resists bacteria. Machine washable - use cold water and hang dry. Ingredients: 100% Nylon, firm texture. Product Size: Brilliant Blue. 28cm wide x 100cm long (about 11 x 39 inches).